I need something sweet to help me function the same way that I need oxygen to help me breath. Trust me. A day without sweets brings on a hangry that no ones wants to see. One of the ways I love to indulge without totally ruining my waistline is in the form of energy balls. I mix up a new batch almost every week, adjusting the flavors depending on my mood and/or the season. My favorite combination typically involves the standard peanut butter and chocolate chips, but with the bout of warmer temperatures we've (finally) been having, I was itching for something tropical this week. Since we always have dried fruit and coconut on hand, it was easy to bring the flavors of the tropics to this sweet snack. What are your favorite energy ball mix-ins? In the bowl of a food processor, blend together the nut butter, oats, flaxseed meal, honey, coconut oil and ginger powder, until well mixed and the ingredients start to clump together. If it seems to dry, add just a touch more coconut oil or honey. Next, add the mix-ins. Pulse about four or five times, for a few seconds each time, or until the mix-ins are slightly chopped up. Form the mixture into balls. 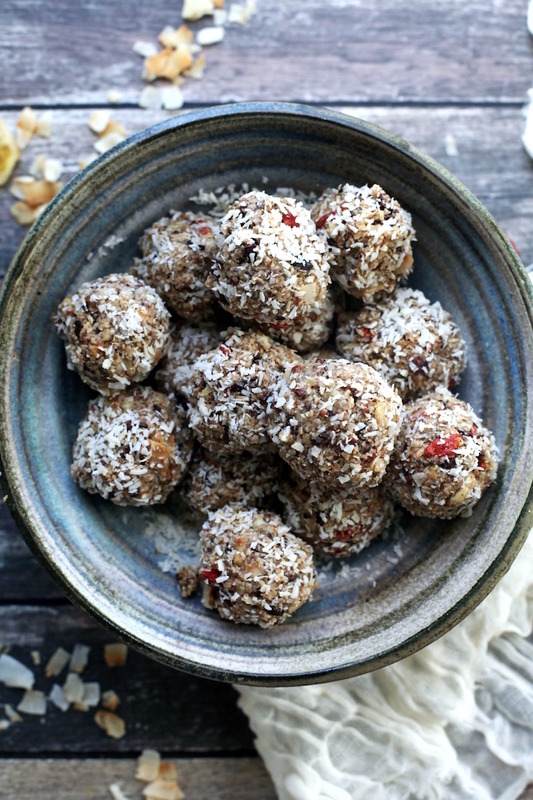 Roll the balls in extra coconut and then place them on a lined baking sheet. Repeat until you've formed all of the mixture into balls. Place the baking sheet in the freezer for about 30 minutes, then remove the energy balls to an airtight container and keep them in the refrigerator.